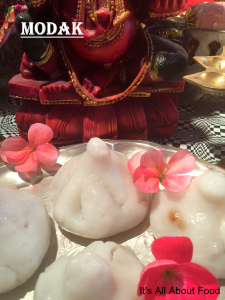 Mushak is Ganeshji’s Vahan and Modak is his favourite sweet… Any Ganesh poojan without modak is as incomplete as any ritual without diya..
We observe this festival with lots of devotion and love and bring Ganeshji to our house for one and half day.. This is the most awaited festival for us, even the kids love it.. We celebrate it with enthusiasm, lots of singing (Aartis, Bhajans), dance, sweets and abundance of food.. Ganpati Bappa Morya… Mangal Murti Morya!! Hi anjali. Hope you are well .